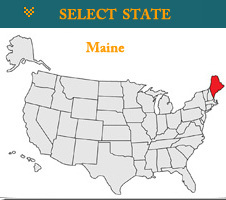 Maine.How to Get a Maine CDL License? Obtaining a commercial driver’s license (CDL) in Maine requires passage of a skills and knowledge test based upon the type of commercial motor vehicles (CMV) being driven. Federal law requires that CDL drivers crossing state lines must be 21 years of age. States may set different age limits for commercial drivers that operate solely within the state. Maine follows federal guidelines that provide for three classifications of CMVs as described below. Class A-Any combination of vehicles with a gross combination weight rating (GCWR) of 26,001 or more pounds provided the GVWR of the vehicle(s) being towed is in excess of 10,000 pounds. Class B-Any single vehicle with a gross vehicle weight rating (GVWR) of 26,001 or more pounds, or any such vehicle towing a vehicle not in excess of 10,000 pounds GVWR. Class C-Any single vehicle, or combination of vehicles, that does not meet the definition of Class A or Class B, but is either designed to transport 16 or more passengers, including the driver, or is transporting material that has been designated as hazardous. Note:A bus may be either Class B or Class C depending on whether the GVWR is 26,001 pounds or more.